@ChiCityShimo breaks down the price to value in their Lab Rat Report If I had a special occasion planned or needed a wine to take to a dinner party, this would be a good option. Our 2014 Winemaker’s Reserve Red Wine is the perfect blend to showcase the deeply concentrated, complex wines of a wonderful vintage. This deep crimson-hued Bordeaux-style blend bursts with expressive aromas of rhubarb, rustic cherry and Christmas spice-cake aromas. Underlying the bright fruits is a subtle smoked meatiness, reminiscent of prosciutto-wrapped fresh figs. On the palate the blend mixes both dark and red berry notes, creating a pleasing mouthfeel with hints of delicate young rose perfume and dusty tannins that dance across your palate on the lengthy finish. Dry, early and shaking is how 2014 will be remembered in Napa Valley, yet it had a silver lining with small, concentrated berries and high quality. February’s rains brought the total rainfall from low to adequate and helped relieve three years of drought conditions. Warm temperatures promoted early budbreak and accelerated grape maturation. Just as harvest began, a dramatic 6.0 earthquake shook Napa Valley awake on August 24; Provenance was fortunate to come through unscathed. We finished the very compact, plentiful harvest by mid-October and celebrated the vintage’s “ripened-to-perfection” grapes. Each grape variety was grown in the specific mesoclimate and soils of Napa Valley where it was able to achieve its most outstanding characteristic. A significant portion of the wine was grown on our estate vineyards. The Cabernet Sauvignon came from the St. Helena, Rutherford and Yountville AVAs; Merlot from the Oakville and Los Carneros AVAs; Cabernet Franc from the Calistoga AVA; Malbec from the Mt. Veeder AVA; and Petit Verdot from the Rutherford AVA. Hoping for some rats on this one!! @jmdavidson1 $32 and change to IL. If we get persuaded and something comes together our way I’d be interested in 3/4. Preferable 3. Random note, this is part of Provenance’s sale today only. $541/case including shipping. @kaolis Have never had any Provenance. 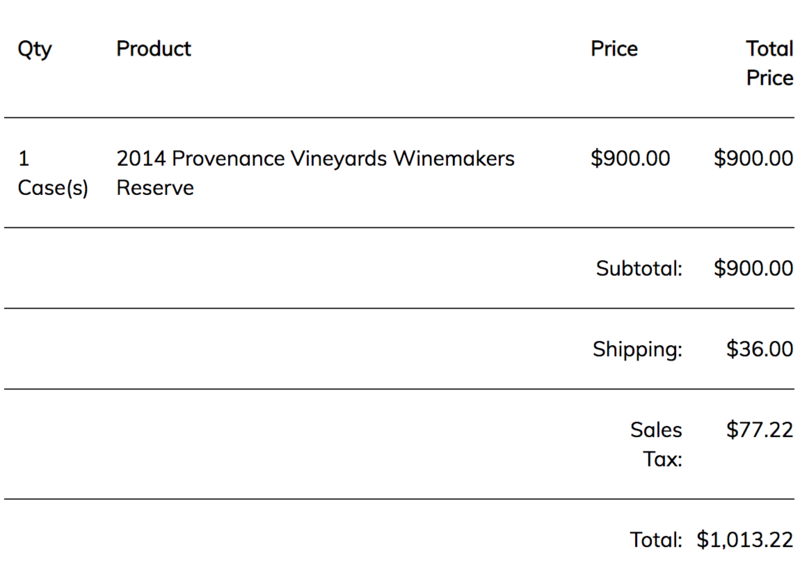 Cyber Monday wine websites could kill my cc. That case price is hard to beat. @novium Wait, Chalone created this winery?! @novium Tom Rinaldi of Duckhorn fame was the founding winemaker and always considered this his pet project. He still shows up to every one of our events. @novium @rollwrig Is the vintner in the house? @foxrunner @novium That’s me (well…sort of). I work here but am not the winemaker. Let me know if you guys have any questions and I will do my best to monitor and answer what I can. @rollwrig yes, I know. He’ll know my dad if you ask. @novium @rollwrig One of the ruling elite need to give you the special treatment in your signature line! @foxrunner @novium Feel free to tag me if a vintner or winery rep shows up and is missing their badge. Any Minnesota folks interested in splitting a case? I have commitments for up to 8. So, need someone to take at least 4 (could part with 6 if necessary). @Rooboy I would be interested in 4. In St. Paul. You anywhere close? @Rooboy Rattage below a bit weak for price, I would still be in for 2 but not 4. @Rooboy In keeping with my resolution to buy less wine, I’ll take the 2 that PRH2 is passing on. At last, a wine for me to 'rat! So, on Friday last, rpm, SWMBO, and BlndBmb8 (aka daughter #1 who has been tasting forever - we have a picture from her first birthday of her pulling a champagne bottle out of a wine rack…) stood to our glasses and modified Davis scoresheets to do our duty for our Casemates. Our approach was typical: Around midday, I pulled the cork and put an ounce or so into each glass for an initial impression. Based on that, I decanted the rest of the bottle and we let it sit for between an hour and an hour and a half while we engaged in other activities. We then tasted again for score. Then had some with turkey leftovers. The rest of the bottle sat in the decanter overnight and SWMBO and I had it with turkey leftovers the following evening (BlndBmb8 had already headed home). Enough with the story, already, I hear you scream, tell us about the wine! NOTE: these notes/impressions were made without discussion and without reading the label re blend/alcohol contact. rpm clearly very closed, needs to open Decant! rpm finish now medium long, appropriate level of tannin detectable no oak no long dominates. SWMBO yes, was better an hour later. rpm a solid wine, good Bordeaux blend, definitely a food wine. Standard: 9-12 (still sound commercial wine, but not very interesting. After the wine was decanted and open for an hour, I liked it considerably better than SWMBO or BlndBmb8. SWMBO generally prefers Pinot Noir to Cabernet and dislikes very big Cabernet/Cabernet blend wines, especially if hot. Likes mature Cabernet made in (e.g.) Corison style or St. Julien or St. Estephe in Bordeaux. BlndBmb8 likes Cabernet, but prefers a lighter, or better yet, leaner style. Likes Pauillac in Bordeaux. I thought the wine worked well after 1-1/2 hours with my leftover turkey late lunch. Even better, after about 30 hours, when I had the rest of the bottle with more turkey leftovers on Saturday evening, the tannins had nicely smoothed and the high alcohol was barely noticeable. Fruit was still very ripe, but it was enjoyable. If you like big wines and you like Cabernet, you’ll probably like this. Would I buy it? Probably not, but then: (1) I have quite a bit of mature and maturing Cabernet/Bordeaux blends (that I know SWMBO and BlndBmb8 will like) in my cellar for drinking at least through 2030 and (2) I rarely drink Cabernet/Bordeaux blends under the age of 10 in any event. At the case price, this is a decent deal, IMHO for those who want a good, solid Napa Cab/Bordeaux blend to drink with food that needs a full bodied red to stand up to it. With decanting, the flavors are right and it works well with food. @rpm Thanks for the report! As expected, you’ve given me all I need to know! @rpm Happy to see you finally got a chance to Rat! I enjoyed the review. @rpm Thank you for this thoughtful and much-appreciated report. My impressions almost exactly, but far more precisely stated; I genuinely learned from your notes. Cheers. Sorry I’m a bit late to post this, but better late than never, right? We were unfamiliar with the vineyard, so we went ahead and looked it up on google. Seems to be well liked overall, although there are not too many reviews available for this particular red blend. In general, I do like red blends when they’re done well to play off different strengths of different varietals. Based on the list price of a bottle this is probably cost prohibitive for me most of the time, so I am glad I’m getting the chance to try one for free. My interest is piqued. The label is no-nonsense, which is the opposite of what I normally end up purchasing, but it has a twist off cap, so I know this wine knows how to party. I’m down. We opened up the bottle and poured a couple glasses through an aerator to drink while we made dinner. Relatively strong alcohol smell right out of the bottle. Once that cleared, it was a clean scent, complex, lots of different notes, difficult to distinguish as an amateur. Fairly light taste, medium body, very smooth finish. Earthy, oakey flavors. We drink a lot of bourbon, and this had some notes that reminded us of that. No real distinct fruits that we could identify. Seems pretty unique. After cooking, we poured a second glass to have with dinner. We were having Korean BBQ pork bowls, and this wine was a great match. It had enough flavor to keep up with the spicy BBQ sauce, but was not too overpowering for the veggies on the sides. The second pour was probably about an hour or so after initially opening the bottle, and the initial alcohol aroma had calmed down a bit. The second glass went down much quicker than the first, and the finish remained smooth. There was very little lingering taste from the wine and it was great for cleaning the palette after eating. We cleaned up our dishes, and poured the rest of the bottle as we sat down to watch some TV after dinner. Glass #3 went down probably a bit too quickly as we were just sitting on the couch. Three glasses in and I’m feeling warm and happy. I could drink this wine all night. Overall, I enjoyed the bottle. After reading the other lab rat report above, I think we probably could have done better decanting this bottle a bit longer, but hey, that’s our inexperience showing. This is a very versatile wine that would be a good match for a lot of different situations. Probably not at the 2 bottle price, but it is something I would keep my eyes on in the future. I’ve got a pretty big stash to work though right now, and at this price point, this is not something I want to just add to the pile. If I had a special occasion planned or needed a wine to take to a dinner party, this would be a good option. That being said - if anyone in the Chicago area wants to split a case a few ways, I would be down to grab a few bottles. @ChiCityShimo thanks for the great rat! @rpm thanks for the tip! Everyone on the '18 tour received a wheel, and, iirc, she also has some informative tutorials online on the how/why of her wine wheel. Well done rpm. Is there a source for additional information about the ‘modified’ Davis method? Nice job on your first Rat! I often find newbees opinions better than the experienced ones. They often are more candid. Thanks! I want these, but this is bad timing. I’m supposed to be Christmas gift shopping, not buying gifts for myself. As such, I shall sit on my hands until the offer rolls over and hope that @winedavid49 can make them reappear in the spring. I’m terrible at this self-control thing. Yes, me too. The recent wine sales, i.e. Benchmark Bin Sale, WTSO Mag Monday, etc., have killed my buying power. I wish WD had a repeat offer week, just as you suggest.